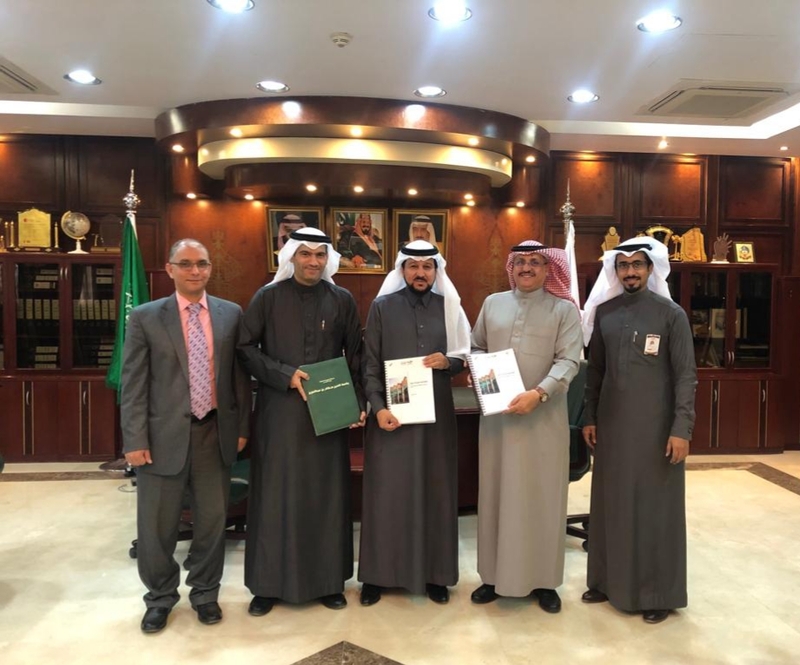 Prof. Abdul Aziz Al Hammed Rector of PSAU received on the university ’s self-assessment report from Dr. Nasser Al Kahtani Vice-Rector for Development and Quality, Dr. Fahad Asahali Dean of Development and Quality. This comes as part of the final steps for the university to obtain academic accreditation from the National Center for Academic Accreditation and Evaluation. Rector praised the efforts of the members of the self-study teams and the accuracy of the information observed in the report. He also stressed that the goal is not to obtain accreditation, but to transform the development and quality practices into a work method adopted by all the university's units and employees. Vice-Rector for Development and Quality said that the report has monitored all activities and operations within the university according to specific criteria and supported by evidence and indicators. He also stated that the University has completed the performance indicators report for all the academic and administrative units of the university, which reflects the quality of the performance based on reference values and comparisons. Dean of Development and Quality said that since the signing of the contract of institutional accreditation with the National Center and the University is working on the study of all inputs and processes and outputs at the University in accordance with the standards prepared and approved by the National Center for Academic Assessment and Accreditation. The report included many strengths and good practices that distinguish the university from its counterparts, as well as the points that the university must work to improve and develop during the next phase. He added the steps aim to achieve excellence in performance and achievement of vision and mission emanating from the vision of the Kingdom of 2030 in the achievement of distinguished education and graduates able to compete in the internal and external labor markets, as well as, a pioneering scientific research and community service that meets the needs, demands and aspirations of our leadership.